As part of my end of the year round-up, I am posting interviews with a few of authors of my favorite books of 2011. Today I'm featuring Jennifer Donnelly, a fabulous author who has writes historical fiction for teens and adults. 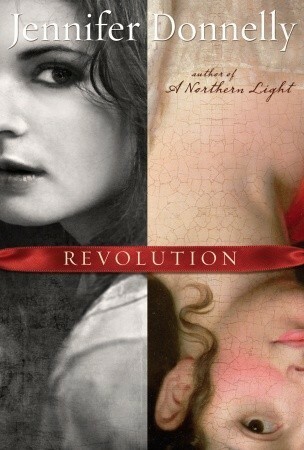 Her newest book for teens, Revolution is in my Top Ten for 2011. Jennifer has also written A Northern Light (for young adults), an adult trilogy: The Tea Rose, The Winter Rose, and The Wild Rose; and Humble Pie (for children). Please welcome Jennifer to Alison Can Read! 1. I loved how you mixed present day and history in Revolution. I haven't read all of your books yet, but my understanding is that none of your prior books have been set in present day. How was writing a contemporary story line different than writing a historical story line? I assume the amount of research is different, but I'm curious about any differences in plotting and character development. Thank you! Yes, Revolution is the first novel of mine that incorporates a modern-day character. As far as differences in the writing of a contemporary vs. historical storyline go – there aren’t any. Research is required for both historical and contemporary settings, events, and characters. (Though the past requires more of it!) The problems of character development – which to me is getting the soul of the person you’re writing about down on paper – are the same. No matter what time period you’re writing about, the characters need to live and breathe. And plot is a difficult, torturous pain in the neck regardless of whether you’re in the past, present or future. 2. You've written about many different time periods and different countries. Do you have a particular time period or historical event that interests you more than others? For example, I've been fascinated with the Revolutionary war and very early American history for most of my life. I’m interested in everything, all of it. Never met a historical site, stately home, castle, graveyard, city, village, or ruin that I didn’t love. History makes my heart beat faster. 3. Historical fiction is one of those divisive genres like sci fi and fantasy that a lot of people are reluctant to try. Do you have a theory on that or any ideas about making historical fiction more accessible to young people? So I’m told, but I don’t believe it. A good story’s a good story. I’ll read anything with a strong, original, beguiling voice, and I think most readers – no matter their age – feel the same way. 4. What are a few historical fiction novels - preferably YA; recent or older - that you recommend? Not all YA titles, but: Octavian Nothing The Passion, Sexing the Cherry, The Witch of Blackbird Pond, A Woman of Substance, all the Little House books, Wolf Hall, World’s End, The Book Thief, Possession (a mix of historical and contemporary). write a lot? Especially someone who may be interested in writing historcal fiction. It’s ubiquitous because it works. I couldn’t afford the money for grad school or the time for a writers’ group when I was starting out, but I always had masterclasses at my fingertips. All I had to do was go to my bookshelves and take down novels by Joyce, Hemingway, Winterson, Boyle, Byatt, Amis, Orwell – the list goes on and on. Shakespeare’s plays. Beckett’s plays. Poetry by Dickinson, Frost, Heaney, Oliver. Who better to learn from? That’s the reading bit. The writing bit is pretty simple, too – write. If you’re like me, you’ll get it wrong for a time. (In my case, a long time!) And then hopefully you’ll start to improve. Writing is the thing that makes you a writer. I loved the book Revolution. Great interview. I really liked this book. =) Great interview. Awesome interview! I loved "A Northern Light" quite a lot because it retains the sensibility of universal themes such as wanting to achieve your dreams and the anxiety/fear/excitement that goes along with wanting to explore the world outside of your comfort zone. I haven't read "Revolution" yet but plan to for next year. I've heard great things about it. Loved the interview! And you know its a shame that I have this book lying around somewhere in my library! I must read it soon!